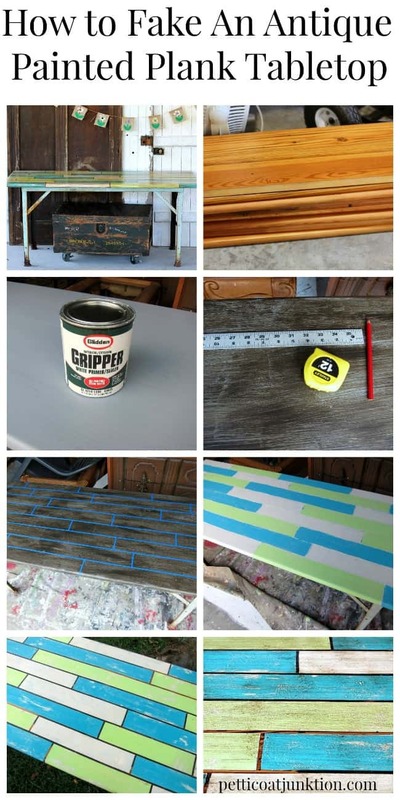 Did you know you can fake an antique painted wood table top……one that looks like individual wood planks/boards from a solid piece of wood? I didn’t either…but I like trying new techniques…..the kind I make up as I go along. I’m a real rebel. I was surprised at how well the project turned out. Let me know what you think about it. There are lots of photos here and a lot of steps in this technique. I want you guys to be able to create this look and I’m including every little detail. 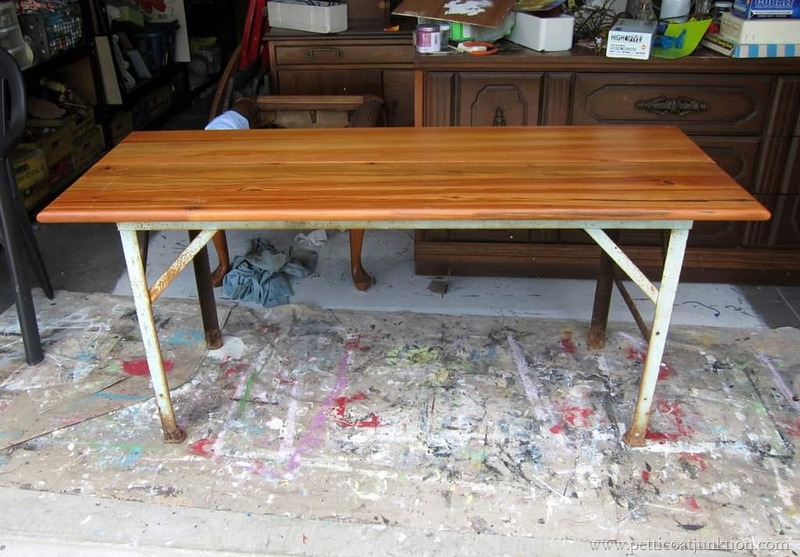 The table project started with the iron table base I found at My Favorite Junk Shop. The JTS put the tabletop on when I wasn’t looking….which happens a lot. I think I’ve finally convinced him that you guys need to see every step of the project. The top is two of these wood pieces that were given to us by his brother who runs a flooring mill. They are 12 inches wide and I forget how long…maybe 4 ft.? I just love free stuff, don’t you? The wood had a heavy coat of varnish or sealer so I used a coat of Glidden Gripper as a base coat before starting the special paint technique. I had the primer tinted gray because that’s the color that works best for me under any paint color. When the primer was dry I brushed on one light coat of brown paint. Not completely covering the gray primer. 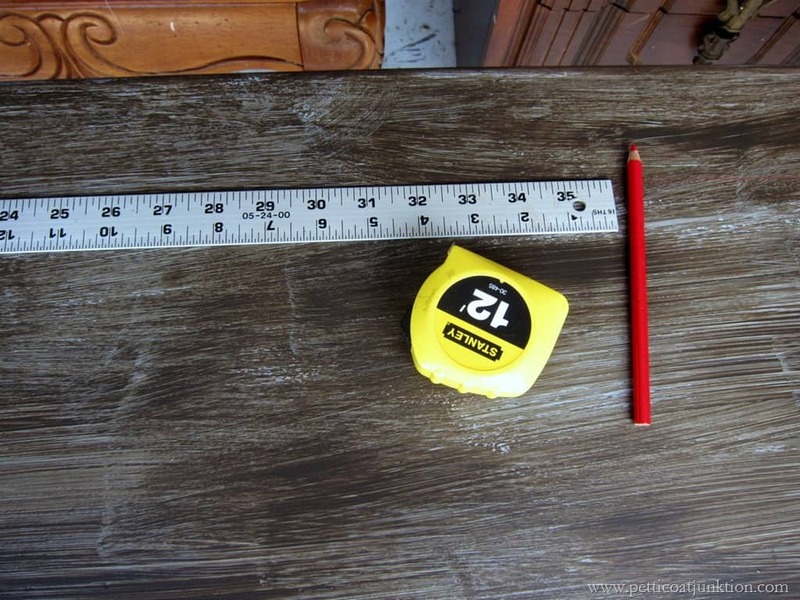 Then I got out the yard stick, pencil, and measuring tape…..
….so I could do this. 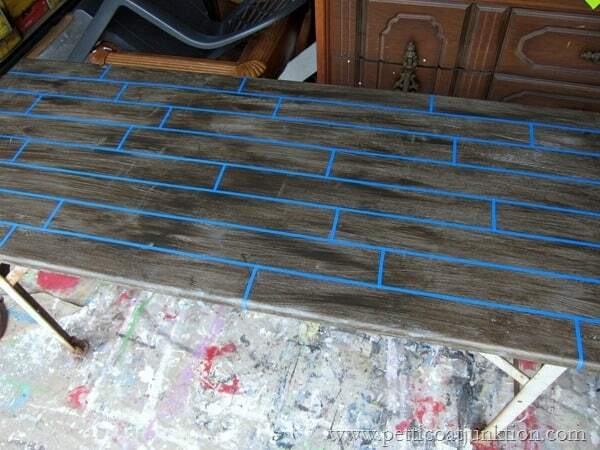 The blue is a really skinny painters tape, probably ¼” wide. I wanted the table top to look like it was made up of small individual wood planks. I painted the whole thing white…trying not to paint over the tape. The tape was so thin that I basically painted over all of it. Oh well, these things happen. 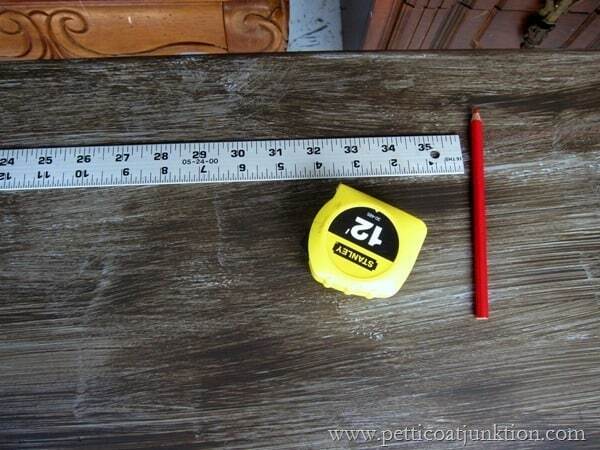 I took my screwdriver and rubbed paint off the tape in areas……so I could find the darn stuff to pull it off. I still had another coat of paint to put on and I didn’t want to cover the tape completely. 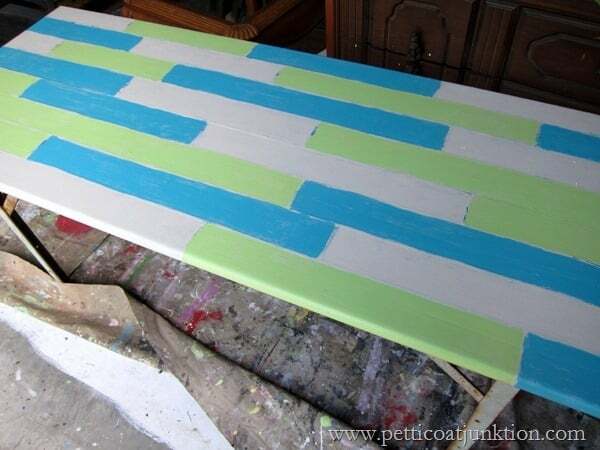 Next I went to work painting the “planks” turquoise and green and leaving some of them white. After that layer of paint was dry I wet distressed the paint in some areas. The corner where I first started peeling off the tape. 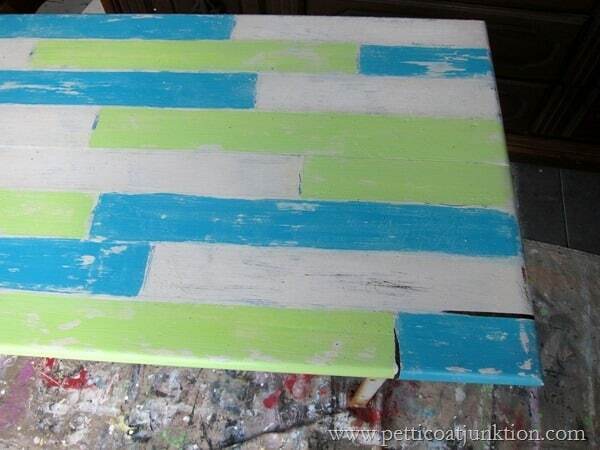 Multi-colored plank tabletop…isn’t it pretty? I could have left it just like this because the colors were really nice. But the iron table base was rusty and aged looking. So for the next step I brushed on Caromal Colours Toner and wiped it off with a rag until I got the antique/aged look I wanted. 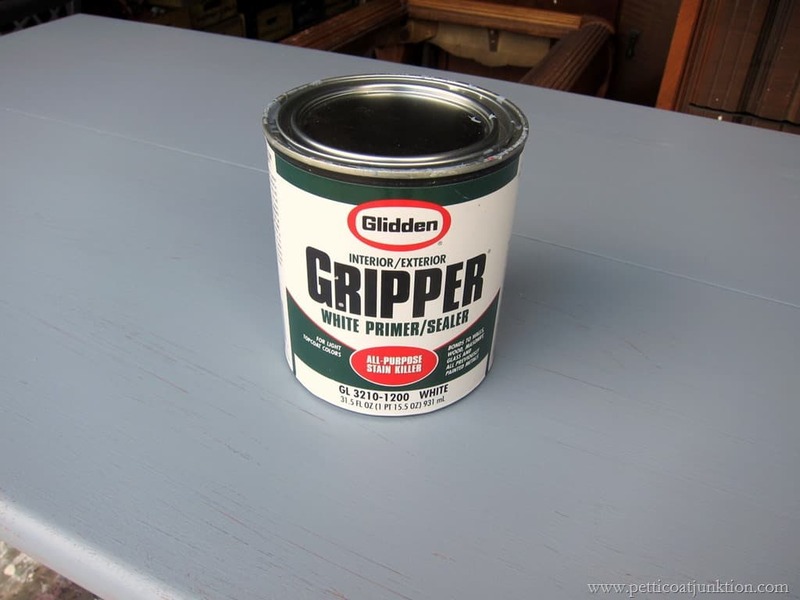 When I brushed on the coat of white paint I mushed it on in places or in other words I took the ends of the paint brush and plopped it on the table. These areas are bumpy and rough and sometimes look crackled. They are just raised areas where the paint is a little thicker. All of this adds to the character and look of aged paint. On the wood areas where the painters tape was placed some of the primer and brown paint peeled off to show the original finish underneath. I didn’t count on this and I think it makes it look more authentic. The primer probably peeled off because I am really impatient. 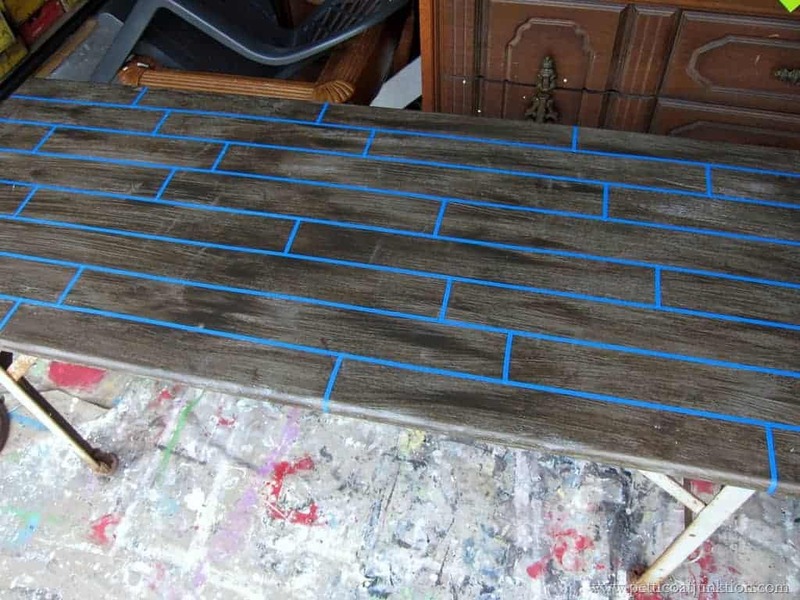 I painted the table with all the layers of the paint (4), distressed the paint, and took the tape off all in a span of 5 hours. I waited until the next day to apply the toner. 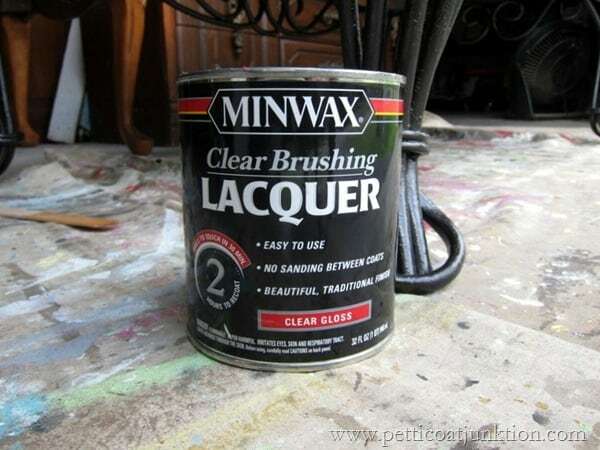 Once the toner was dry I used a coat of Minwax Lacquer to protect the paint. 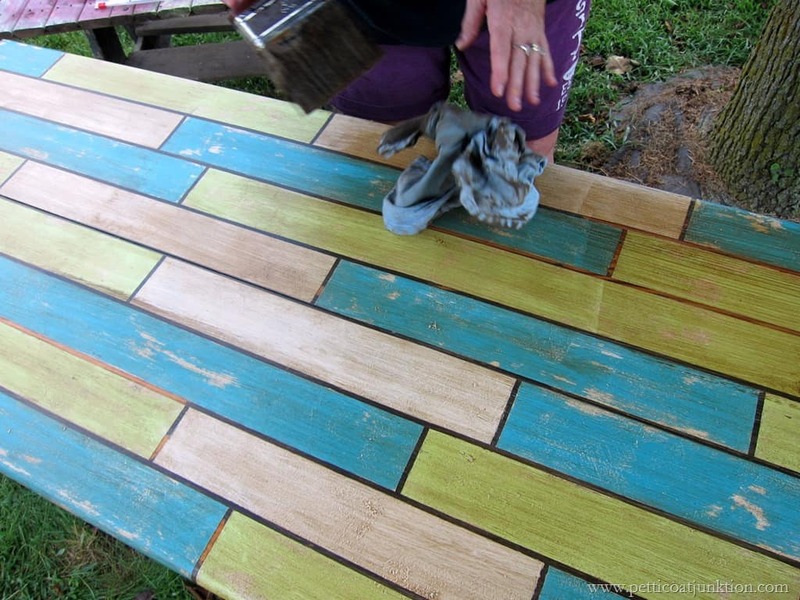 Sooooo….that’s my technique for faking painted wood planks. Pretty good huh. 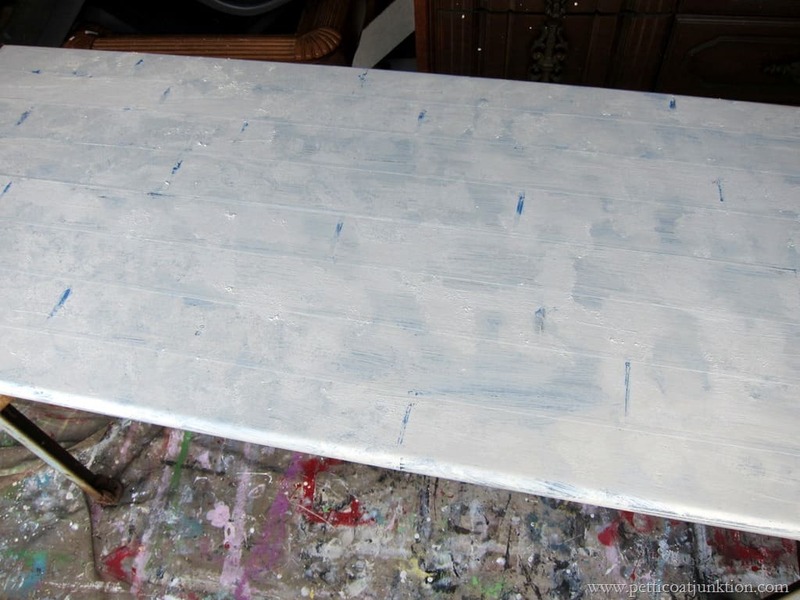 How about a table with a weathered white washed finish? 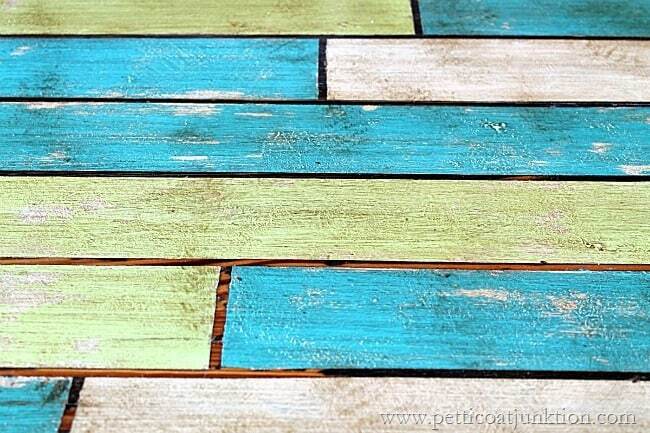 See it here….Perfect Weathered Finish. 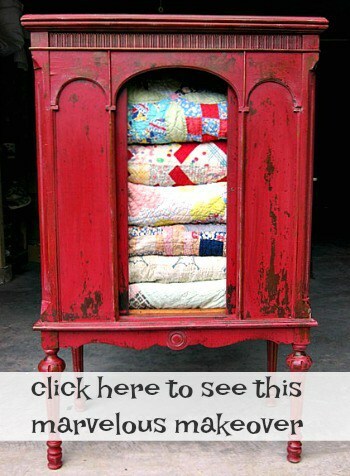 This project first appeared on Petticoat Junktion in 2014. 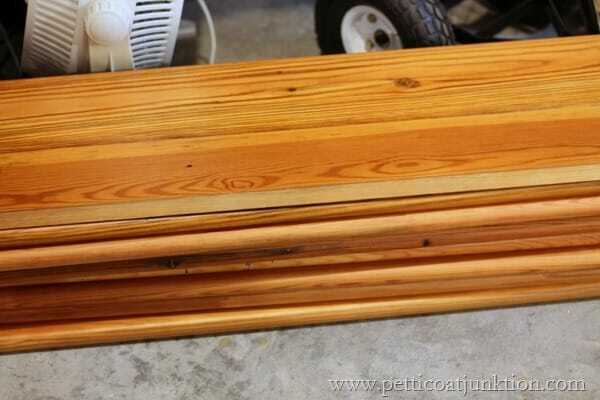 The posts has been updated with new photos and paint details. This is so pretty. Once again you made a fabulous silk purse out of a cow’s ear. You sure nailed it this time. The photo is pretty new. Thank you!!! 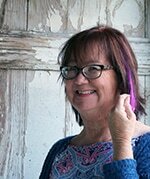 I went crazy and got a purple(now pink) stripe in my hair. I love it! looks fabulous, might just have to give this a try!! stunning. You are so clever. You must have read my mind, glad to hear your hubs is doing so well with his recovery. When my Mom had triple by pass and heart valve replaced she was in hospital for at least a month then had to go to rehab place. Your hubs is doing much better. My Mother kept smoking right up to her surgery so maybe that’s why it was harder for her. Really glad to hear your hubs is doing what he should and getting better. 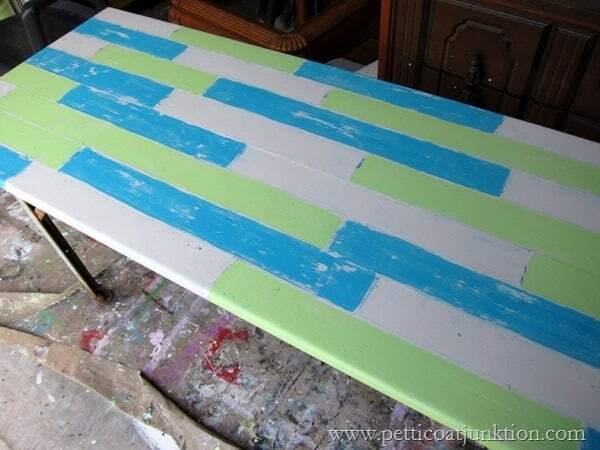 Love your table top, you little stinker, you always figure it out don’t you, love the colors you used. I have hard time being patient also. Turned out good tho. Great tutorial, love the table and glad I am following you…you’re so creative! and I love all the other blogs you follow too. 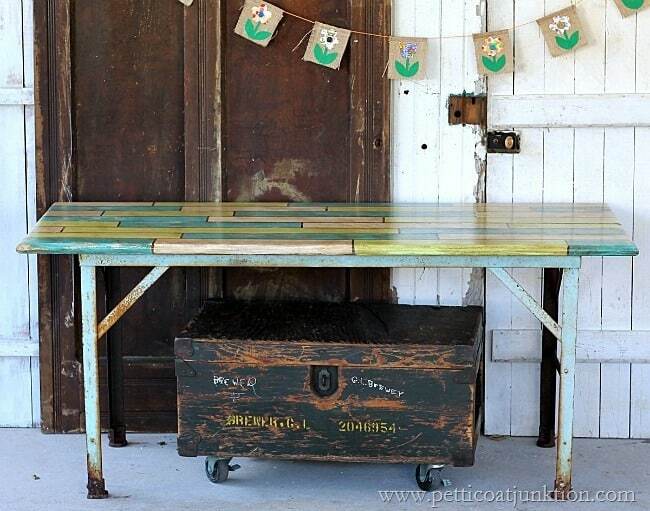 I really would have painted the table wood colors, but that’s just me…I am in love with old wood plank tables. But your colors are great, too! In the first picture, my thought was that you had used lots of different pieces of wood! But the effect was created via paint! Cool!!! Awesome tutorial Kathy! 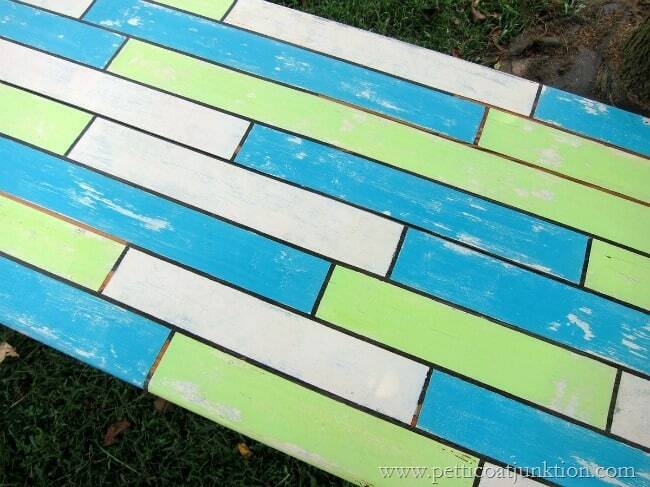 Love your plank table! Adding the toner is the key. So glad the JTS’s check up was good, he will be back working with you before you know it. 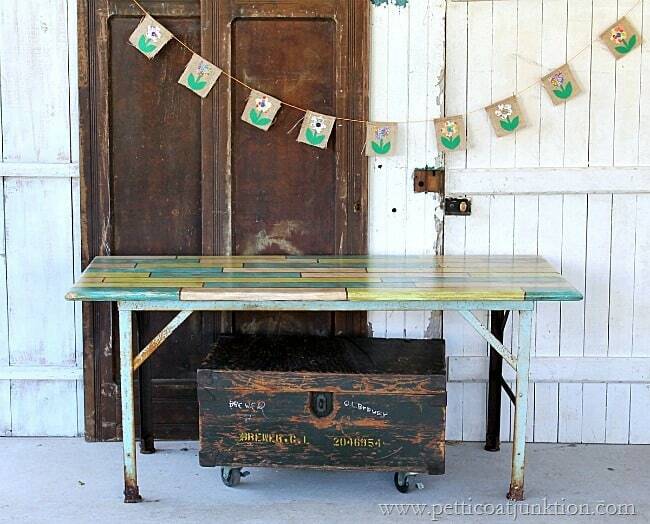 I absolutely love that table, it just amazes me how you picture what you want then you just do it. Are you going to sell the table? 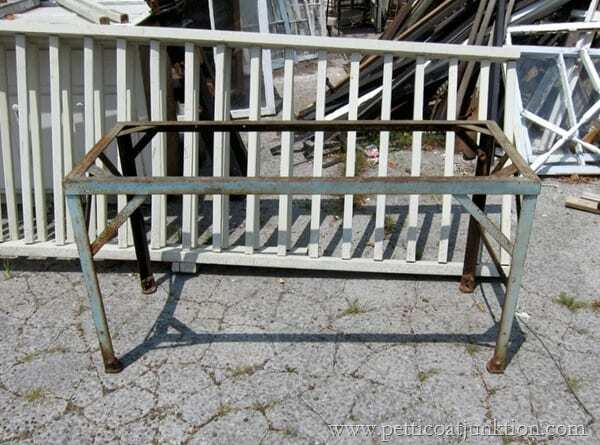 The perfect top for the old rusty painted base. Looks like it was made and painted that way in its original state.